Even if you're not a naturally skilled baker, you can create five-star desserts with The Perfect Bake 2.0. A real-time digital scale joins forces with an ingenious (and free) mobile app to walk you through making perfectly prepared baked goods with minimal mess. As you pour ingredients directly into a bowl, the on-screen smart scale adjusts in real time. And by measuring in weight instead of volume, The Perfect Bake 2.0 guarantees ideal proportions to ensure the best-tasting treats. Effortlessly make desserts from an ever-expanding database featuring hundreds of recipes or add your own creations to the app. 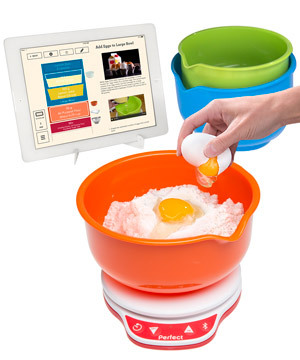 Includes three color-coded mixing bowls, a smart scale, and a phone/tablet stand. Compatible with iOS and Android devices. This video features the original Perfect Bake. The new version of the Perfect Bake (2.0) features a wireless scale and no longer ships with an oven thermometer. At Vat19, we love sweets. In fact, our love borders on obsession. Sadly, we typically must rely on the kindness of others (or resort to using cash) in order to obtain sweet treats. With The Perfect Bake 2.0, however, we're proud to say that anyone (yes, anyone!) can now bake just about anything — and it'll taste amazing! At its essence, the Perfect Bake 2.0 is a wireless digital scale paired with an ingenious app to ensure perfectly baked treats every time. Baking by weight is faster, more accurate, and delivers tastier treats than baking by volume. Included free app measures for you! As you add an ingredient, the on-screen smart scale adjusts in real time. No more measuring cups. No more conversions. Just keep adding the ingredient until your mobile device beeps (indicating that you should stop). However, even if you over-pour, the app will adjust the quantities of the remaining ingredients to ensure perfect proportions. The app is mind-boggling. Every step is made as mistake-free as possible. It'll tell you what kind of bowl to use for each step, which oven rack to use, and even what type of attachment to use on your mixer. It also features built-in timers that auto-adjust based upon the user-selectable serving size. Furthermore, if you don't know how to beat an egg, finely chop nuts, or form tuiles, it'll teach you via an instructive video right from inside the app. They've honestly thought of absolutely everything. 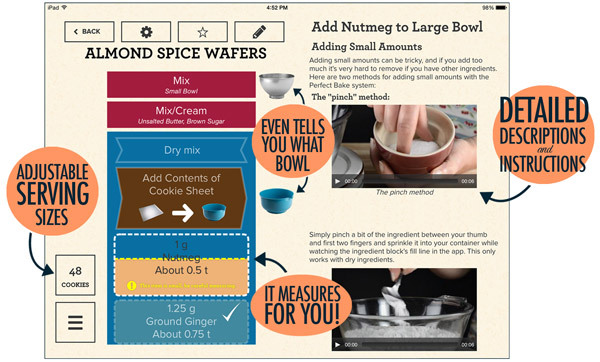 The Perfect Bake 2.0 includes an amazingly detailed, helpful, and intuitive FREE app. Seriously, anyone can bake delicious treats thanks to The Perfect Bake. Baking requires precision. To ensure the best taste, every ingredient must be in the correct proportion to every other ingredient. A bit too much flour or not enough brown sugar can spell baking disaster. Simply put, measuring by volume isn't accurate enough for baking. 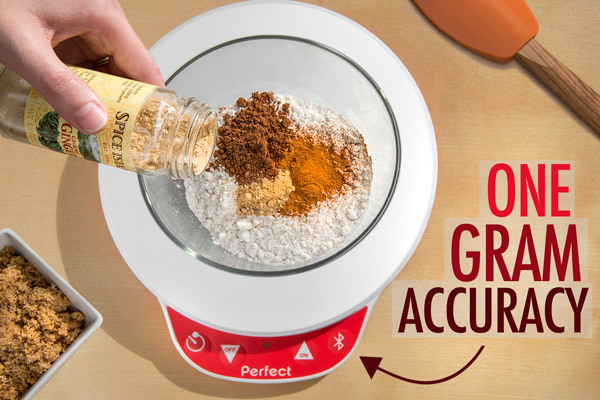 The Perfect Bake 2.0 includes a super-accurate digital scale (with one gram accuracy) that when paired with the app, guarantees that your tasty treats come out exactly right every time. The included scale is accurate to within 1 gram. Measurements are taken 30 times per second. The Perfect Bake makes baking fun, easy, and delicious for the whole family. With a database of more than a hundred recipes, we're sure you'll find something that piques your interest. Try baking perfectly proportioned versions of classics like chocolate chip cookies, brownies, and biscuits. Or expand your skills with something new like cherry cream cheese coffee cake, pistachio ice cream, sweet crepes, or white chocolate pot de creme. With the Perfect Bake, you can do it! We know from experience: with zero baking background, we effortlessly created a batch of almond lace tuiles (top left of the picture below) that looked and tasted amazing. Oh, and if you have a family recipe for super delicious sugar cookies, feel free to add it to the app. That's easy, too! Get started with one of the hundreds of included recipes or add your own! In the mood for something sweet, but not sure what you can make? Use The Perfect Bake's pantry feature. Simply enter your available ingredients and the app shows you what you can make. Enjoy the adventure! 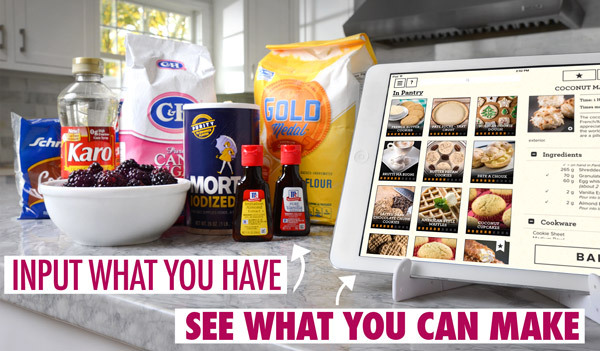 Enter your readily-available ingredients and the app tells you what sweet treats you can bake. The Perfect Bake 2.0 includes everything (except the ingredients, of course) to start baking mouthwatering desserts. In addition to the smart scale, you'll also receive a phone/tablet stand and three color-coded mixing bowls. 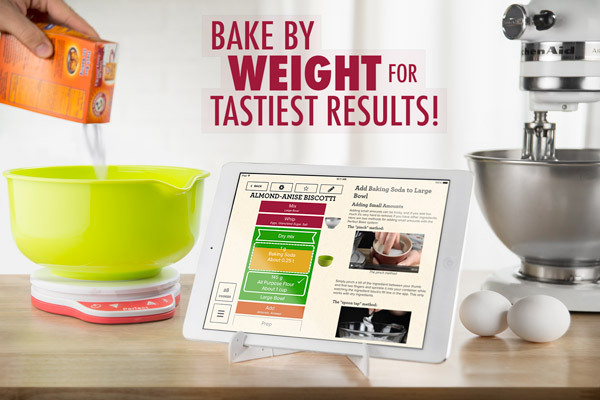 The Perfect Bake 2.0 includes the smart scale, a phone/tablet stand, and three mixing bowls. Question: Does it work with my device? Answer: The Perfect Bake 2.0 is compatible with any device running iOS 6.0 or higher as well as any device running Android 4.3 or higher. It is not compatible with the Kindle Fire or the Google Nexus 7 (1st generation). Question: How does the smart scale connect to my mobile device? Answer: The scale connects to your smart device wirelessly via Bluetooth. Question: Can I use my cookie sheets, bowls, and other containers with the smart scale? Answer: Yes! The Perfect Bake 2.0 app will always tell you which kind of container to use for each step. 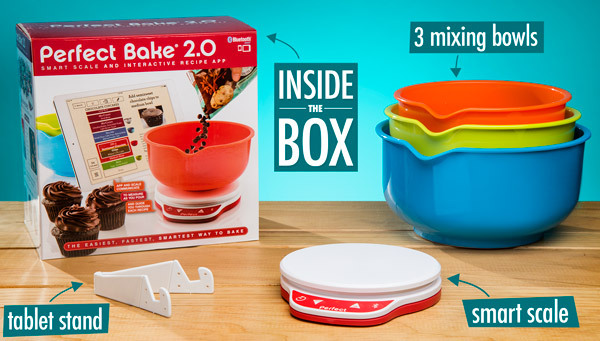 Oftentimes, it'll show you which of the three color-coded mixing bowls to use. But it may have you put a cookie sheet or chopping board directly on top of the scale. Every step is clear as day! Question: How many recipes are included? Answer: The app is updated monthly with new features and recipes. 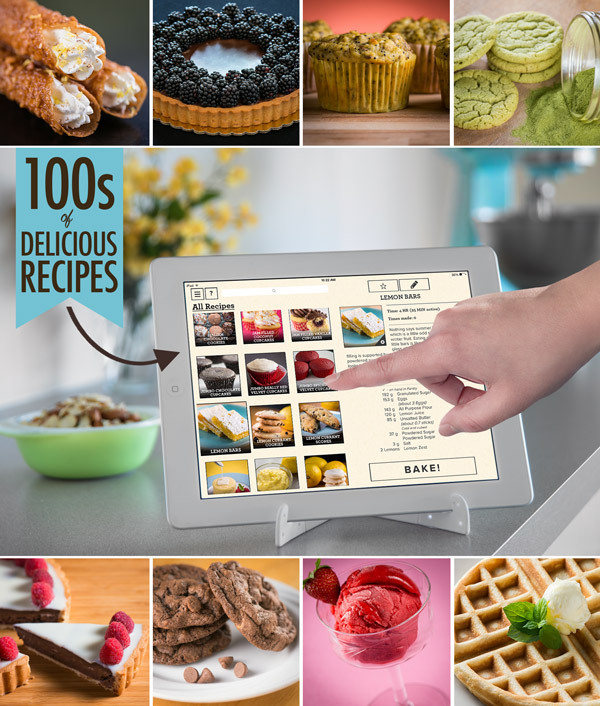 It currently features hundreds of recipes, detailed how-tos, and dozens of helpful videos. The app is amazing as far as usability and instructiveness are concerned. Question: Can I add my own recipes to the app?